We’re in Shreveport on business any good restuarants around here? Well, there’s a Mexican place over by the WalMart. And there’s a Cracker Barrel. Every place has something they are known for. My home state of Washington is known for salmon, apples, and world famous dungeneus crab. I’ve often bragged about the salmon to my coworkers. There is really no compare between fresh Pacific salmon and Atlantic salmon. My coworker grew up on the East coast but he lives in Utah now. He recently travelled to Seattle on vacation. He called me around dinner time. Rodney, I’m at Anthony’s, that restaurant down on the waterfront. Yeah, it’s a nice place. I have to say that all those times you talked about how great the salmon was, I kind of thought you were were sort of a snob about it. The same coworker and I are in Shreveport, LA this week. We are expanding our operation and I’m here to check on our progress. Actually, I’m here to help the client check on our progress, and my friend is here to do a security assessment. Tonight was our first night. In town and we asked the front desk at the hotel for recommendations. I’d been to Shreveport before. Isn’t there a place a couple miles east of here that has crawfish? Crawdad Kitchen? Yeah, they’re fantastic. Great food. 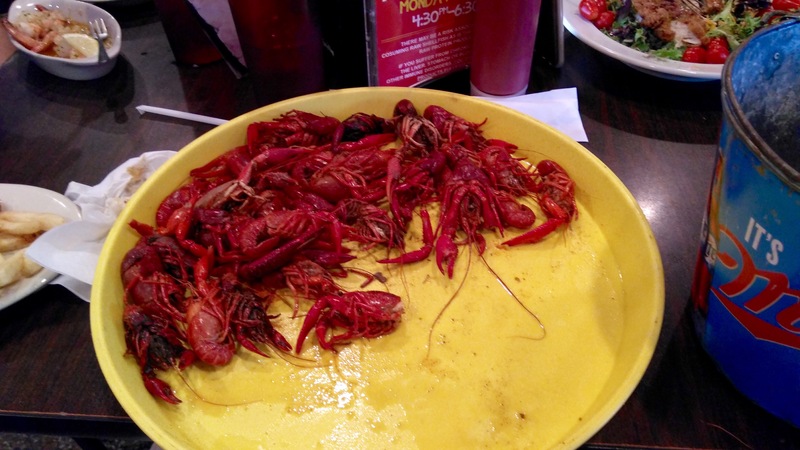 Have you ever eaten crawdads? Crayfish? They are served boiled. But, if you are used to boiled potatoes, or corn on the cob, or hard boiled eggs, it’s nothing like that. Crawfish are boiled in cajun spices, and while corn and potatoes are added, they quickly take on the spicey flavor of the crayfish. Crawdad Kitchen serves lots of different types of food. It serves burgers and fries, shrimp and salad, and of course, lots of cajun food and boiled crawdads. You buy them by the pound. I ordered one pound with a couple potatoes and some corn on the cob. My coworkers ordered the chicken salad and the shrimp. They didn’t even want to try one. What a shame.